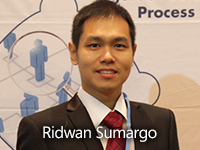 In its Silver Anniversary year, Ridwan Sumargo, the second generation of forwarder at CQR Surabaya spoke with us about the company’s humble beginnings and how it has changed in the last 25 years. Q. Can you tell us a little about the history of PT ARAYA BANGUN SARANA? A. PT ARAYA BANGUN SARANA is a family owned business started by my father, which began life as a trucking company and then in the early 90’s, due to the demands of more complex procedures and bureaucracies, became a forwarder. I am the second generation in the business. Q. What would be the most significant shipment/project your company has handled? What challenges did it pose and how did your team overcome them and successfully complete the shipment? A.The expansion project of Camco Omya factory. At that time, there wasn’t enough qualified heavy cargo transporters and road conditions weren’t good either. The location of the future factory site with its rugged terrain made transportation a big headache; the trucks had a lot of blown tires. To ensure minimal problems and delays, we carefully planned each journey ensuring each cargo was delivered safely (80MT per load) although slowly. Q. What are the main challenges freight forwarders in Indonesia are facing at the moment? A. There are many but if we are talking the biggest challenges, then it’s the Port authorities and Shipping Lines adding Forwarding divisions and trying to steal our market share. Then there are the government regulations that are slowing down export/ import activities and also making us forwarders less useful. Q. How are you and your team meeting these challenges on a daily basis? A. We strive to provide a better service and extra services each and every time. The challenges we face get harder every day and we require more than just hard work to produce smarter employees; we endeavour to seek out their hidden potential. Unfortunately, Indonesia is not known for the quality of its human resource which is difficult considering a forwarding companies’ most valuable assets are their employees who must often communicate, coordinate and make important decisions at crucial times. Q. PT ARAYA BANGUN SARANA has been around now for 25 years, how different is the company now to when it was founded? A. Back then we WERE just a simple trucking company born out of the necessity for transporters, business flourished and we were much needed. Now the market is overcrowded, everybody is doing and developing the same things, it requires extra work to exist and improve. We have also shifted from semi-old fashioned methods to more modern methods. Q. Do you have any current plans for PT ARAYA BANGUN SARANA? A. We are developing a courier cargo service for smaller packages to meet E-commerce demand. We also plan to work more on domestic forwarding sectors as there are many islands and ports which are yet to be explored. Q. Where do you see the company in 10 years? A. We see the company being more sophisticated in some areas as specialisation is more and more demanded, Forwarding and Logistics distribution will be more closely related. We invite members with shipments in Surabaya to get in touch with the team.